Welcome back to the PC Gamer Q&A. Every week, we ask our panel of PCG writers a question about PC gaming. This week, a big hypothetical one with no basis in reality: if EA lost the Star Wars license, who should get it next? This follows a petition to 'revoke' EA's ten-year Star Wars license—like someone's been drunk at the cockpit of an X-Wing or something—but it's more an excuse to discuss the Star Wars games we'd love to see and probably never will. We'd like to read your suggestions in the comments, too. Yes, that's the studio that makes Euro Truck Simulator. But hear me out. The Star Wars universe is an expansive one, and I think games need to branch out beyond lightsabers and space battles. So I'd love to see SCS make a game about being a space trucker in a galaxy far, far away. Picture it. Piloting a chunky old cargo ship, delivering a load of blue milk from Scarif to Coruscant. Or maybe it'll set on one planet, with you driving around the deserts of Tatooine, delivering cargo between moisture farms and spaceports. I've had my fill of the exciting stuff from the movies: I'd love a new, more grounded perspective on the Star Wars universe, and SCS is the studio that could pull it off. I'd give it Introversion Software. I love Prison Architect, and I want some kind of deep Star Wars sim management game. A couple years ago I played PA's escape mode with a Star Wars mod, which was fun and a nice fit. But I'd love to really plan and build a proper Death Star, manage the staff, keep the construction on schedule, force-choke lazy foremen, sic some hovering torture bots on captured rebels, keep a few more battalions on the forest moon to protect the shield generator, blow up a few peaceful planets to test my superlaser, and double-check the blueprints to definitely make sure there aren't any thermal exhaust ports just below the main port. Give it to MachineGames. With the last two Wolfenstein games, the studio performed a miracle in turning an absurd alternate history premise starring the walking embodiment of testosterone into something that handled gravitas and gunfights better than most modern games. Imagine a Star Wars game with better writing and characters than the films. Imagine mowing down Stormtroopers (how appropriate) with some hulking prototype blasters and homebrew lightsabers. For a game to truly emulate how Star Wars movies feel when we watch them, it needs a team like Machine Games that can conjure people as memorable as any Han Solo and brief, loosely directed action to carry them along. Mostly though, I just want to take a space hatchet to some Sith. Take Divinity: Original Sin 2, double the budget and throw Star Wars junk in and you've got a beautiful freeform co-op Star Wars RPG that would surely be handled more deftly than 'do bad things and get more Dark Side points.' I'm imagining turn-based combat with Force abilities and blasters, a starship to act as your home, and a story that wanders as far away from the films as possible. Must let us play as aliens, too. Why don't more Star Wars games let you play as non-humans? InXile—I've really enjoyed the Wasteland 2 and Tides of Numenera games, and those were done on a shoestring budget compared to what the company could do with Star Wars. Give us a deeper, meaningful story with turn-based combat mechanics. The options for weaponry and Force powers would be there as well, plus some base building, spaceship combat, and more. Basically, it would be a modernized take on KOTOR, perhaps set in the period between Episodes VI and VII. The game could have you playing as the First Order, done in a fashion similar to Tie Fighter where the rebels are treated like the bad guys. I'd actually be okay with EA keeping it, on the proviso that Respawn gets explicit orders to reboot the Dark Forces series which, in this hypothetical corporate wonderland, it has also painlessly acquired the licence to. 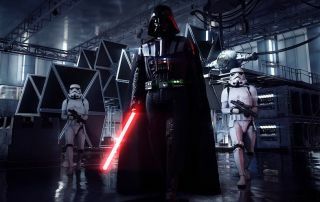 The finished game will have you playing as an elite Stormtrooper captain, like Phasma but less lame, and will feature a needlessly controversial intra-level sequence in which you have to laser loads of younglings. Vince, if you're reading this, call me. After Pyre, I honestly have no idea what a Supergiant-developed Star Wars game would be like. Bastion and Transistor are similar on their surface, but play dramatically differently, and Pyre is a strange hybrid of visual novel and sport. Supergiant makes a point to do something different and new and surprising with every game. Surely they'd make a Star Wars game unlike any other. And you know it would be beautiful. I'm giving the lazy answer: let Obsidian have it. Or at least give it to Bethesda and then they can rent it out to Obsidian to drive on the weekends. So long as they get to make more games like Knights of the Old Republic 2, only with better combat. And enough time to put a proper ending in. No one's suggested a starship combat game yet, and that's what I'd like to see. Marauder's House of the Dying Sun marks the last time I really enjoyed a space-based combat/tactical game, and I'd love to see X-Wing brought back in that fashion. Basically, the same game with X-Wings and TIE Fighters sounds great to me. Maybe I just want a mod? While Battlefront has been a rocky road, though, and Visceral's Star Wars game ended up being a sad tale, I still think we'll get some decent games out of EA. Bethesda aside, I can't think of many publishers who would realistically be able to afford the licence and do a better job with it. Respawn is a safe pair of hands, and BioWare is bound to make a singleplayer Star Wars game again. Both of those would make me pretty happy, assuming the loot crate content for both is non-existent.